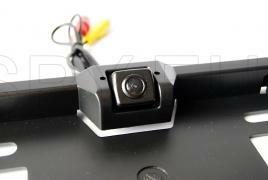 This mini camera is inserted into the plastic base of the car registration plate. It transmits via cable a standard video signal that can be used to aide in the park or be connected to a recording device. The camera is waterproof and is resistant to high humidity, temperature and dust. 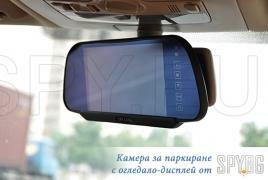 With this system for reverse parking you will have a seven-inch display, which is integrated in the rear-view mirror. The display has two video inputs as the second input can be used for a second camera, DVD player or any other video source. For your convenience the system has a remote control for brightness, color and contrast and switching between the two video inputs. The camera has four bright LEDs that provide excellent visibility even in total darkness. 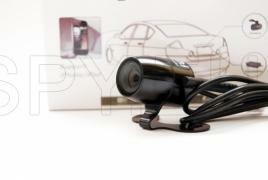 The camera can be connected to the reverse lights and it will be the perfect parking assistant. 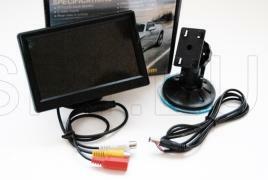 With this 6 inch LCD display you can have a look at each location from your vehicle. It works with voltage 6 to 32V DC and can be mounted on cars and trucks. There are two video inputs one of them is with higher priority which means that the display automatically switches to it when this input receives video signal. So you can connect a camera that starts when you turn the lever for reverse and you will have great visibility when reverse driving. The other input can be used for a second camera or video player, DVD, navigation , etc. On the extremely thin display of this parktronic you will receive information about the side on which the obstacles are, sound and color indications for the distance in meters. In the kit you receive four sensors, control module and display. 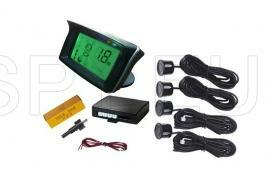 Power supply voltage - 12 V, and the operating temperature is -35 to +75 degrees. Dimensions of the display are 78x30x16 mm. This parktronic will feel confident while you park your vehicle. 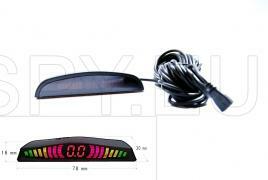 It has four sensors, control module and a color display with size 7 cm. When parking you will be warned about obstacles at distance over 2 meters. Apart from the sound alerts you will have the information about on which side the obstacle stands, and three different degrees of warnings - green, yellow and red. In the package you will also find a handy tool for drilling the necessary holes for the installing the sensors . With this parktronic you avoid using cables from camera to a monitor in the compartment. The camera creates a wireless network that you can use on your phone, tablet or other electronic devices with a wireless Internet card. In this way, the mobile device will have a clear view to the rear and graphic reference to the proximity of the various objects. To use the system you need to install the free application depending on the device - iPhone, iPad or Android. 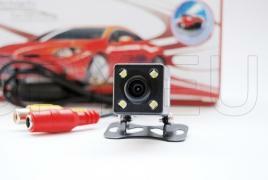 The camera has protection IP66, the power supply voltage is 12V DC. 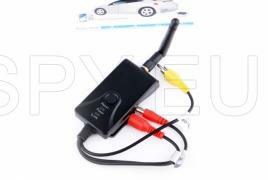 This transmitter can easily make video parking system. Install in the rear of the car a CCTV camera, connect it to this Wi-Fi transmitter and you can watch the back of the vehicle on your phone or tablet. Powered by Android and iOS devices and transmitting a signal up to 50 meters in direct line of sight. Transmits VGA resolution and 30 frames per second. Dimensions: 78 * 43 * 18 mm.